Salary negotiation is a skill that once learned can take your earning power to new levels. Stepping into a situation of discussing salary requirements is never easy. You really want the job, but you want to be paid well also. You deserve to be paid well after all. How do you convey this to your potential employer? It can be very intimidating and difficult to discuss this issue in a productive manner. The company knows what its limits are. They also recognize that you require a certain amount to satisfy your ability and qualifications. Listed below are 7 steps and tips to help you get into the right frame of mind- your salary negotiation mode. Look the part. If you want to make a million bucks, you need to look like a million bucks. In preparation for all of your interviews and meetings, be well dressed. Invest in a manicure, and buy a new suit or other appropriate outfit. If your hair is colored or highlighted, make sure that there are no roots showing. Not only will these investments make you more appealing to an employer, they will make you feel better about yourself. When going into salary negotiations, you need all the confidence that you can get. Looking at yourself dressed up and ready to take on the world, you will feel better about yourself. You need to be pumped up and expect to achieve the salary that you deserve. Patience is key. Don’t rush into salary negotiations. Be patient and hold out on discussions until after the job has been securely offered to you. If you are required to provide an expected salary, be vague and offer a range or state that the amount is conditional upon the job specifics. Whatever you do, don’t pinpoint your salary goal while others are still in the candidate pool. Wait for the employer to give you a starting number to begin negotiations. Generally the person hiring will leave room for a 10%-20% increase from the starting point depending upon the candidates specific qualifications. So wait for the employers number, then go from there. Be well informed. Don’t go into negotiations without being educated upon the fair market value of your position. Find out what other companies are paying for this job. 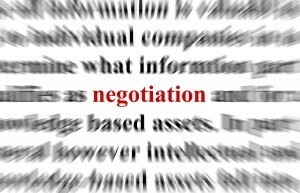 Although you can’t fling this in your employer ‘s face, it can help you to determine appropriate negotiating steps to take. Know what you’ve got. Try to determine how your education and experience level stacks up against others in your position at other companies, as well as within the company you are dealing with. Figure out which of your features you should highlight. Would you be the only one in your department with a masters degree? Do you have more years of experience than others? Find your selling point and use it. Perhaps it is simply your positive attitude and self-motivated work ethic. Set yourself apart, and make the employer want to pay you top dollar. Stay focused. When dealing with the company, pay attention to clues which may reveal values and qualities which they particularly seek in an employee. This can help you to determine which of your own qualities to highlight during negotiations. You are desirable. Sell yourself. The company obviously wants you or they would not be offering the job to you. Adopt the right attitude. You don’t want to appear arrogant, but there is no harm in letting your employer know that you are worth paying extra for. Get a positive attitude. Perhaps the most basic but also important step to achieving the correct salary negotiation mode is to maintain a positive attitude. Go into salary negotiations believing that you are worth the salary that you want. Make them buy you for a reasonable market value, but one that is fair and takes into account your additional qualities. Sharon Alexander – ClaimThatJob.com, a resource for identifying the key steps to becoming a highly paid and valued person in your industry of choice.